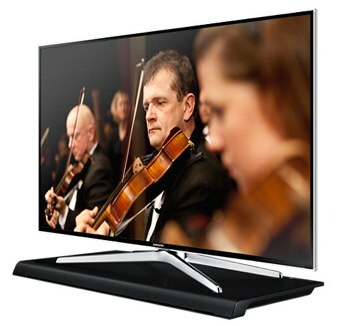 Looking to upgrade the sound you get from your big-screen TV without installing a bunch of speakers? The soundbar, a long, slim speaker with amplifiers and surround-sound processing, has been our go-to choice, with great options even below $300. But lately we’ve been seeing a new type of discreet sound system that’s worthy of your high-end TV: the soundbase. Instead of being mounted above or below your TV, a soundbase sits underneath. Since new TV bases are big enough to support TVs of 40 to 60 inches, there’s plenty of room for high-quality speaker components, including woofers, in super-slim boxes. The result is clear, immersive sound with minimal visual impact. The soundbase speaker category is still in a nascent stage — so much so that companies haven't firmly decided on the "soundbase" name for this type of speaker. We've seen sound stand, speaker stand, sound platform and a handful of other names, but they’re all the same type of product. Here are four of the most promising soundbases we’ve seen, some of which are available now and some which will be coming out later this year. Boston Acoustics recently released the $300 TVee One Speaker Base with aptX Bluetooth technology. Streaming music over Bluetooth usually means some loss in audio quality, but with aptX you get higher quality and less latency, so music sounds more the way it should. The soundbase supports TVs up to 60 pounds or about 50 inches. If you want to go high-end, there's the $600 AudioXperts 4TV Model 2112. This soundbase is designed to be eye-catching, thanks to a slim profile and smoky glass top. Its audio performance matches the Model 2112's good looks, and with aptX Bluetooth you're bound to get the best audio no matter what the source. The one big drawback? No HDMI support. Coming to market next month, the Samsung HW-H600 ($400) is designed to blend with your décor rather than stand out, shifting all the focus to their sound. The 4.2-channel sound includes a subwoofer, so the H600 can easily fill a small room with well-rounded audio. It won't do as well in larger rooms, even though the base can support TVs from 32 to 60 inches (and 77 pounds). Even without a TV, the base has plenty of uses thanks to built-in Bluetooth connectivity. Also coming next month, Philips' new Surround Base does double duty as a Blu-Ray player, a combination that makes a lot of sense. The $300 Blu-ray Surround Base is made from wood, not plastic, which accounts for its acoustic superiority. Like the Samsung model, it does best in smaller spaces since it only supports TVs up to 55 inches. This makes it perfect for a bedroom home theater set-up, especially since it includes some smart TV goodies such as a direct connection to Netflix and Vudu streaming video services. This soundbase makes pairing your smartphone via Bluetooth very easy thanks to NFC — just tap and you're connected. These four soundbases are just the beginning of high-end soundbase speakers. Keep an eye on the market as their form factors, features and quality continue to evolve, making them a viable option to the already popular soundbar. This was a timely piece for me because I’ve been looking for a solution for my bedroom. Did you look at soundbases from ZVOX for this piece? I found them when I was looking for a solution for myself. Looks like they’re not a good choice if you want surround sound, but the commercial volume feature looks great. Just wondering if the Techlicious crew has come across them and what the verdict was. Thanks. I have seen Zvox soundbases and the one that supports up to 55 inch televisions looks like a good one for older TVs. Zvox hasn’t updated their soundbases in a while and so they don’t include HDMI or Bluetooth connectivity as standard. That makes them not as useful for newer TVs. To add to what KT is saying, the ZVOX units are also clunkier than the models above and not as appealing design-wise (your opinion may vary) - the ZVOX 555 is 3.4” and the ZVOX 580 is 5”, while the Samsung and Philips (non-Bluray) are well under 3”. Whether the thinner units will provide the same level of sound quality, we’ll know better when the units are available for testing. Thank you both for your feedback! For the room I’d use it in, the HDMI and size issues don’t matter. I can’t wait to see reviews on the Phillips - love the speaker/Blu-ray combo.